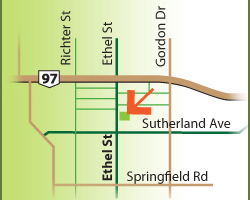 Ethel Street Therapeutic Massage Clinic (ESTM) offers experienced Registered Massage Therapists (RMTs) who have training in a wide variety of therapies and techniques. All RMTs attend regular ongoing massage therapy education. ESTM was established in 1996. A residential setting gives the clinic a relaxed, professional feel. The clinic is wheelchair accessible with level parking out front and on the street. Our staff of Registered Massage Therapists have each completed a specialized education program to become a Provincially Registered Massage Therapist. BC has the highest standards in North America for Registered Massage Therapists. Our RMTs are fully insured and are qualified to provide medical services under the BC Medical Services Plan (MSP). Registered Massage Therapists honour a strict code of ethics as set out by the CMTBC. Patient trust, privacy and confidentiality are respected.